The Lodge cares about its residents. More than just a place to live, The Lodge is a warm community full of seniors who are excited to live each day to its fullest. From our extensive activity offerings to our beautiful amenities, The Lodge is truly one of a kind. 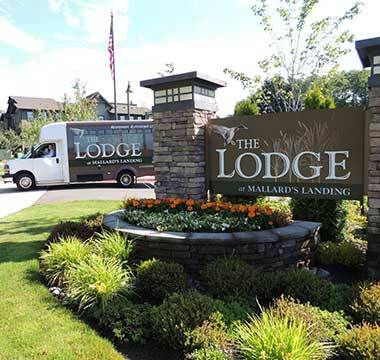 Combining our cozy, rustic setting in Gig Harbor, Washington with the friendly community at The Lodge makes for a place that anyone would want to call home. We are always looking forward to meeting new people and families, and hopefully one day call them residents! Below is a list of some of our offerings. Simply click on any listing to learn more. 7 days a week from 7 a.m. to 6:30 p.m.—our dining service offers chef-prepared breakfast, lunch and dinner for residents and their families. We put together a monthly calendar of upcoming events so that residents can look forward to their favorites. Families are encouraged to visit and take part in these events, whether it is live music in our game room, special outings or support groups. Click here to learn more about cozy Gig Harbor and the surrounding areas of The Lodge. From waterfront views to friendly downtown area, there is much to be explored. Hear from current residents about their experiences and life at The Lodge. Click here to read about the positive experiences many seniors have had and why they would recommend this community. Hello! Meet the people who work to make every day better than the last at Mallards Landing. We would love for you to learn a bit more about us and how we have come to call The Lodge home. You have a question, we have an answer... click here to read commonly asked questions. If you don’t see your question listed, please do not hesitate to call or email us for more information. We look forward to chatting!